A huge dollop of marmite-step from 16Bit aka DRT and Kidnappa, providing their debut release on Boka Records and it's one that's bound to divide opinion between the rave heads and the progressives. For our money, it's a belter. 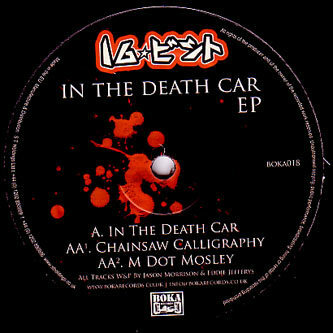 Coming from the same rave considered angle as Caspa or Rusko (who've been massively supporting this 12") 16Bit unleash the full might of their digital studio techniques on three tracks of brutal dubstep variations, largely hinging on the halfstep rhythm but shot through with 10,000 watts of current. Title track 'In The Death Car' starts off with what sounds with a sample from Emir Kusturica's Arizona Dream (check out Goran Bregović awesome soundtrack if you don't know it), but soon descends into fierce synthline manipulations and stinging rave signals certain to fire up the dance. 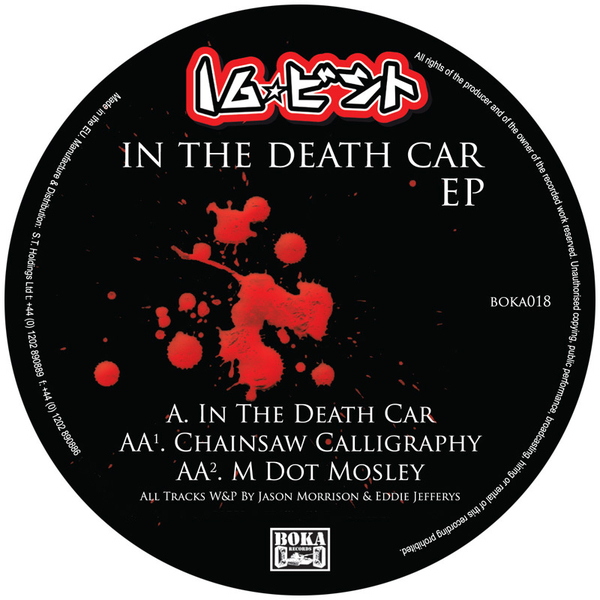 Things start to get far more interesting on 'Chainsaw Calligraphy', merging musique concrete and dubstep like nobody before them, with rasping chainsaws battling wounded synth squalls with a minimised rhythm straightjacket keeping the hole thing from cutting loose and lopping your face off. 'M Dot Mosley' finishes the set with the sound of a fax machine doing dubstep with intriguing results, and leaves you wondering what the chuff will come next from these guys. Massive 12" with Caspa, Rusko, The Others, N-Type and Rossi B & Luca.